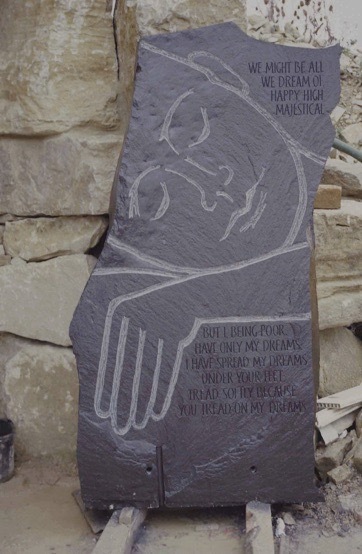 Some of four (two double sided) slate standing stones (tallest 1500mm high) with sleeping heads and words about boats, sea, spices,sleeping and dreaming for the Docklands Granada Travelodge London. 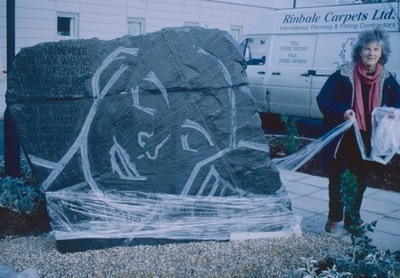 1997 Public Art Commission. 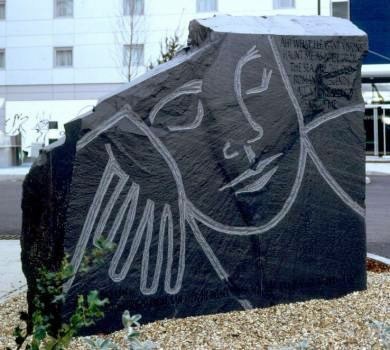 4 standing stones at the Travelodge, East India Dock Road, London. Carved Burlington blue slate clogs. The texts and images are a response to the general environment and the particular site. The larger than life sleeping heads are combined with words, some familiar and some less known, which refer to travelling and dreaming.